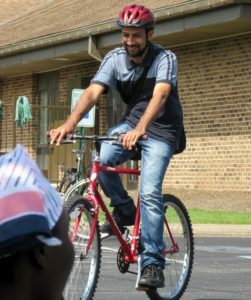 The Shenandoah Valley Bicycle Coalition (SVBC) is helping local refugees with bicycles for transportation. This initiative began in November 2015 when a group of refugees in Harrisonburg identified transportation as a major challenge. For many refugees, bicycling is the most efficient and reliable transportation available. Since the Shenandoah Valley Bicycle Coalition aims to foster all forms of cycling including for transportation, this partnership is a natural fit. Are you interested in donating? The SVBC takes earmarked donations specifically for purchasing bicycles for refugees. We are a 501(c)3 and can provide you with a tax receipt for your donation. We always need donations to purchase bicycles and gear for refugees. Church World Service Immigration & Refugee Program (http://cwsharrisonburg.org) works with new refugee families and signs up individuals interested in bicycling to commute to work, school, appointments, and shopping. 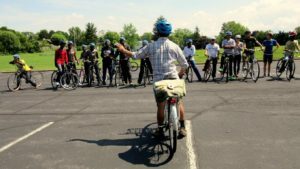 Those individuals then attend a class taught by SVBC members where they learn basic bike skills, safety skills and bicycle related laws. At the end of the 2-hour class, refugees get to take home their bicycle, helmet, bike lock, and bike pump. If they want any additional help or teaching in the following weeks or months, we are happy to schedule additional one-on-one classes with them. To date, we have given away over 50 bicycles and taught over 60 refugees cycling skills. 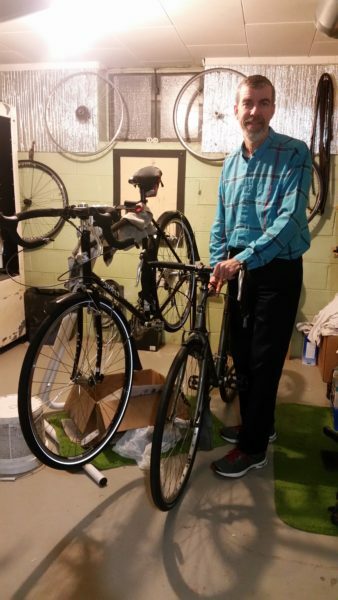 Do you have an old bicycle to donate? We will gladly accept bicycle donations that are repairable and can be reliably used for daily commuting. And we can get you a tax-deductible receipt. If you speak a foreign language, we would love your help teaching classes. The language barrier is one of our biggest challenges. If you have a background in bicycle mechanics or want to learn, you can volunteer to help repair bicycles. Our volunteers meet most Mondays 9AM-noon at the Bike Hub behind Gift and Thrift on Mount Clinton Pike. Please check out https://thebikelab.org/ for more details about how to help us wrench. Are you a cyclist? You can help teach hands-on bicycle classes with our refugees. If you would like to teach but need some instruction to feel comfortable teaching new riders, the club sponsors teach-the-teacher classes for volunteers; just ask. Do you have a car that can fit bicycles? We need help shuttling bicycles around town for pickup, repair, or donation to refugee families. If you are a part of a local organization with interest in the program, we love partnerships of all kinds and would be happy to make a presentation to your group or organization. For questions, contact, donations, or to volunteer, please email Ritchie Vaughan at [email protected].